This indecisive product swings in between a perfume and a body oil, but to judge by the fact that 1/5 of the bottle was gone only 5 days after Azuree joined my glass clan – I think of it as a body oil. The scent is mild and non-overpowering. Despite its definite presence and unique odour, it does not seem like an improbable act of insanity to wear other fragrance on your wrists while your skin is covered with the glowing aura of this subtle, sensual scent. I was a bit surprised when I smelled it first because it is rather spicy. With all the coconut and gardenia hype, one might grow to expect Azure to be just another fun suntan oil scent. 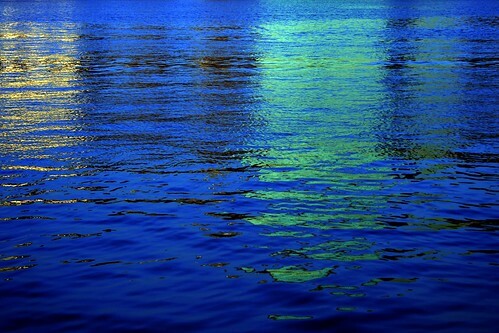 Azure is mostly a woody scent, warmed with allspice and cloves. It has a spicy-sweet and woody-dry, warm presence at first, with less-than-obvious melted-honey-comb top notes. Than it gradually melts into the skin and radiates an aura of warm sand and skin, or shampooed hair heated by direct sun light. The gardenia is very subdued and so are the coconut and myrrh. The overall feeling when wearing Azuree Body Oil after a while is what one would want a sun tan lotion to be: a non-obstrusive complement to one’s skin. And that’s what I love about it. A downside is, though, that all the cinnamic acids and spicy aromas can be a bit tough on the skin. If you have a sensitive skin don’t apply it all over your body – it may result in a burning or itching sensation or irritation to the skin. This is why it would be nice if it came in a more concentrated oil that can be applied discreetly to pulse points, or just a perfume, a-la-Youth Dew Bath Oil. indigo, originally uploaded by Farl. Visit Cognoscented to read a shivering review of Indigo, the perfume tribute to my mother. colori, originally uploaded by mafaldablue. Mimosas were my step-grandmother’s favourite flowers. We always stopped on the way to Tel Aviv to pick the long stems, bubbling with yellow pompons, and make a wild bouquet just to make her happy. 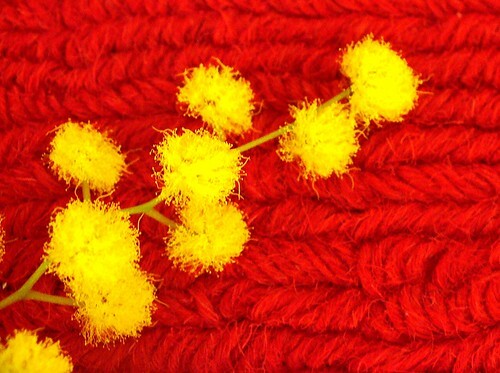 By the time we arrived at her doorstep for a Friday night dinner, we have left behind us a trail of mimosa pollen, from the station-wagon, all the way up the stairs, and honestly – I don’t know if there was much left of the flowers at all. But I think it still made her happy to hold real mimosa stems in her arms. My step-grandmother made the best Moroccan food, only from scratch, of course: couscous (but really from scratch, you just can’t compare it to store-bought couscus in a million years), mufletta, galette biscuits to dip in the sweetest spearmint-black-tea, coconut cookies adorned with a tiny silver ball, almond cookies with a clove bud stubbed at their heart, and my favourite of all - beet salad, and candied miniature eggplants, spiced with cloves. It’s unbelievable what you can turn into jam if you follow a good Moroccan recipe, you can practically turn rocks into candy! Because she spent so much time in the kitchen her face and skin was always soft and a little bit glossy from the oil. The food was always very colourful and flavourful, but now that I look back it seems as if she lived a very grey life. She was always working hard and serving her family, raising 6 kids in the depression of the 50’s in Israel when everyday commodities were sparse; and so she had to be improvised - shoes were cut-to-fit the growing feet, and stale bread was made into fancy patties soaked in tomato sauce. These were just some of the legends I heard of her life as a young mother. The only thing I remember of her that would hint that she actually did something to indulge herself was her collection of perfumes. She had quite a few, but they were all in her bedroom, which I only remember as very dark, and so I don’t have any vivid visual memory that would support my theories about which scents these could be. As a great admirer of the French culture, I am sure she had No. 5. And so she should have. But also, whenever I smell Cinnabar and Youth Dew EDP, I immediately get a glistening glimpse of a hidden retro bottle with dark juice and gold cap winking at me from a dark room. It took me a while to connect it to her. So I think she must have had at least something similar to either of these American scents. Bal A Versailles is another possibility… These will all remain mystery, as my step-grandmother took her perfume secrets to the grave. She died of a heart attack after receiving the news of the assassination of Israel’s Prime Minister Izthak Rabin. What was it in mimosa flowers that made my step-grandma so happy, I would never know. Maybe it was their vivid yellow colour. Maybe their delicate scent reminded her of Morocco, where she was born and raised. I hope that my mimosa perfume, when it is ready to emerge from its genie incubating tube, and meet the skins and noses of living people, will form yellow clouds of happiness around them. Visit Cognoscented to read Suki's review of my very own Signature Perfume, Espionage. Thank you for the orchids, Suki! * The image to capture your visual attention is a portrait of Mata Hari from Mata-Hari.com. Osmanthe Yunnan is another citrusy osmanthus, much in the same vein as Ormonde Jayne’s rendition of the flower. The osmanthus note here is buried gently under myriads of sheer veils of citrus and tea. It is subtly floral and complemented by the green floral notes of freesia, which also lends it a somewhat peppery accent – an interesting counterpoint to the apricot-skin top notes of the osmanthus flower. I like the way the tea, with its acrid and peppery personality is mingled with the greenness of osmanthus. Osmanthe Yunnan is a subtle, well done scent – but whatever amount of osmanthus there is in Osmanthe Yunnan – I still find it very under-satisfying. Notes: Yunnan Tea, Orange, Freesia, Osmanthus, Apricot, Leather. Of all the recent Osmanthus themed scents I have smelled, this is the most floral. Yet, it does not make me think of osmanthus in particular. What I get at first is a creamy reminiscent of aVasline Intensive Care Body Lotion embrace – soft and clean. This is tinged with peach and apricot skins, which is the part where the osmanthus makes its modest entry, but the overall impression is of a peachy, slightly coconuty suntan lotion. The floral heart is very appealing and has a somewhat Victorian feel to it, like a powdery violet scent, along with soapy jasmine and tuberose greenness. Keiko Mecheri’s Osmanthus is my favourite of all the scents I tried so far from her line. But as an osmanthus scent, it is still not the one I would pick for someone to try in order to get a good idea of what osmanthus is suppose to smell like. It’s a fun, comfort scent that makes me think of summer and gardenias. Image is from Neiman Marcus website. Ormonde Jayne's Osmanthus is my least favourite from this collection of exotic-flower-themed line. The citrus and marine scents that are amongst my favourites are scarce - so it shouldn't surprise you. Ormonde Jayne's Osmanthus is a citrus woody with hints of florals that are hard to detect. I cannot find the osmanthus notes there at all but than again it could be my body chemistry playing tricks on me. It is very similar to the Creeds in my opinion - something metallic in there. The base is woods with light musk. My favourite part of the perfume is the beginning -though I wished the Pomelo note was more true to the real fruit. I don't find the davana there, nor the osmanthus or jasmine sambac or even a hint of spicy pimento that are listed in the notes. It is mainly a citrus, musk and cedar scent on my skin. When I smell it I miss the originality and mystique of Cahmpaca, Ta'if, and Ormonde. I found this one quite anemic in comparison to the rest of the Ormonde Jayne line, but it is a fun scent to wear sometimes, when running along the grey-beach-sand early on a chilly morning. In the next few weeks, I will be reviewing all the osmanthus perfumes that I can get a hold of. Osmanthus is an unusual note, and being an expensive and rare perfume material, it is not often used as a main theme. I will be exploring some osmanthus-themed scents, and sharing my impressions with you. If there is any osmanthus perfume I don't know of and you think I should try, drop me a line. Habanita was the first item I won on eBay - an EDT mini bottle, in the shape of the bottle originally designed by Lalique. And of course – I bought it unsniffed, and completely confident that I will love it, which prove to be true. Perhaps this is why it brings to mind lonely adventures, and radiates a definite confidence of a man aware of his weaknesses and knowing well how to hide them. In a far away country in South America, away from his beloved family, and doing everything to make sure they are safe and constantly prove to them that they are loved… He is keeping a secret, too many secrets, and the weight is heavy on his shoulders. Yet he knows and shows true generosity and is kind to all as much as he can when given the opportunity. If I could assign any character to this perfume, it would be Alec Leamas, the hero in The Spy who Came in From The Cold. If he ever bothered to put on any perfume before spending hours waiting for his agents to pass the walls separating between Eastern and Western Europe, and smoking packs of cigarettes in the long and cold yearsof post World War II – I am sure it would have smelled like Habanita. Whether if you are a man or a woman, Habanita possesses all the warmth and protection you need, and can make you feel extremely confident in a most dangerous way. It’s daring combination of notes makes it extremely masculine and appealing to women at the same time. It is bold and softly enveloping, professional and shamelessly sensual, cool and calculated while warm and sizzling with passion all at once. Though it was designed for women, I find it to be an ideal scent for men (I should revert to my efforts of convincing my boyfriend to wear it next time I do). For both men and women to wear Habanita would mean being seductive in a dangerous way (and by that I mean an interesting combination of passion and aloofness that perhaps most of us find oddly attractive), sensual and adventurous, mysterious and assertive. The heart note is not quite the main theme in Habanita, but rather assists in bridging between the lighter and somewhat sharper top notes and the dark leather-tobacco base. The heart has mainly jasmine and rose, which do not make the composition floral in any way. Again, they are there only for harmonizing the blend. There is quite a bit of heliotrope, which has a rich and somewhat powdery vanilla-like aroma, and a bit later you may notice some fruitiness that is quite reminiscent of peach. The base for Habanita in this case is actually the core and the true heart of the perfume. A rich tobacco accord, very much like fine Cuban cigar – enriched with full bodied layers of tonka bean and vanilla is the absolute essence of Habanita. It is deepened by a lovely amber, and just hints of oakmoss, musk and perhaps a very tiny amount of vetiver. The drydown, though still quite the sweet cigar and amber scent, has some chypre and woody qualities to it. The dry down impression of Habanita is that of a subtle, skin-reminiscent scent. The kind of fragrance that if worn properly may be soon identified by your surrounding as your own natural scent… In that sense it works similarly to Shalimar on my skin, only it is a bit more balanced as the ambery-vanilla sweetness is there only to counterpoint the bitterness of the leather and tobacco notes (and is no the main theme that some find is overly done in Shalimar). Top notes: Mastic, Cedarwood, Lavender, Bergamot, a hint of Juniper berry, Leather notes Heart notes: Jasmine, Rose, Peach, Heliotrope Base notes: Vanilla, Tobacco, Tonka Bean, Amber, Oakmoss, Musk, Opoponax, Vetiver. P.s. As you could tell, I did not manage to scan the image I wanted to share with you. In fact, I couldn't even find the photo! One can always blame it on the starts - Mercury in retrograde, blah blah blah. I will have to add the photo later, because it absolutely belongs to THIS post! P.s.s. Updated October 30th to add the scanned image. I will be posting a review here shortly, there is a photo I would like to scan first, but if the technical difficulties persist, I will post it without the photo I have in mind for it. House No. 102178 - Ayala Moriel on Basenotes!!! Basenotes, one of the best resources online for getting information about your favourite perfumes now features Ayala Moriel Parfums! Basenotes is an extremely friendly and informative online discussion forum where perfume lovers around the world can discuss their fragrant experiences and share their knowledge and passion. to announce their love of perfume to the world at large. Membership is free of charge. However, many Basenote members have decided to put their money where their words are, and support this website, which offers great services for the perfume community, and also educates the otherwise scent-ignorant public about perfumes. Supporters receive some extra benefits, such as being able to keep private notes for each perfume in the extensive Fragrance Directory. The directory is an elaborate perfume database. It sorts perfumes by their houses and the year they were created. It also provides an elaborate pyramid of the fragrance notes – the top, heart and base note for most perfumes. You will also find information about the perfumers who created them and the bottle designers, and links to sources online where you can acquire the perticular fragrance you are looking at. Many thanks to Grant Osborne for running Basenotes for the past 7 years, and for adding Ayala Moriel Parfums’ fragrance pyramids to Basenotes' Directory! I am sure it took a lot more than just a couple of minutes to add all my 53 fragrances (including the Zodiac line) and their entire fragrance pyramid. Thanks to Grant, you can now find the fragrance notes for my entire collection on Basenotes. A dream come true. Grant and Basenotes - I applaude to you! I find it quite difficult, generally speaking, to document my progress during the process of designing a fragrance (except for, obvioiusly, documenting the actual formulas, for technical reasons). I usually start with a concept – an inspiration. I obsess about it for a while (anywhere between a day and a few years) before I start to actually, physically, blend and marry the essences I have chosen. There process is rather internal for the most part, but can be also viewed on my endless notebooks, sticky notes, index cards, napkins, anything that one can write on (that is only if I don’t have my note book with me – which is very rare: I carry a note book everywhere I go, just like a photographer must carry a camera, I need a tool to capture my olfactory visions whenever they occur). My formulas are written in a secret arcane language of mythical alchemical hieroglyphs, so that only few can understand. When I go to my pyramid, I will take them with me and everybody will have to try and decipher my formulas from scratch (with a little help from a mystical chromatograph). I have decided, though, because I have shared with you some of my soliflore thoughts, and I am in the midst of creating a new soliflore (which I probably shouldn’t!) - to try something new. So I will share with you the evolution of my osmanthus soliflore, which I haven’t yet decided how to call it (which is one part of the problem). It’s an interesting experiment for me, in seeing how recording the physical phases helps me out with achieving my goals for the perfume. But also it’s an interesting spin on the observer’s effect. Will sharing my process interfere with the result? We will see. 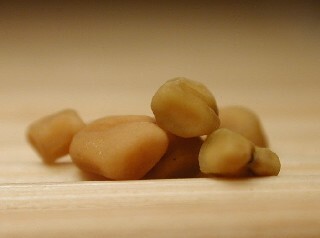 fenugreek_seeds, originally uploaded by garu2000. This is my first try. I went bold and daring, and put in the greediest ingredients I had in terms of olfactory space. Including two that I am not at all familiar with, and that are not particularly accommodating. I hoped that helicrysum absolute (a material I am using for the first time) will provide a dark, tea-like base, and that davana will add fruitiness. Well, I was not far off. At first it seemed to go rather well and smell osmanthusy and full bodied. However, after a very short period of time, the osmanthus and fruit wears off, and a pungent, persistent body odour creeps at me. As if I was taking my food with Hilbah - a Yemenite fenugreek condiment (this can happen also after eating certain East Indian curries, also made sometimes with fenugreek). For the same reason I avoid Hilbah in all its forms, I am tempted to avoid this phase one. It’s dark alright! But not what I want. The davana adds a somewhat repelling winey note, but if you bear with it for a while you got to like it for what it has to offer. It does steal the show now, though, after maturing for about a week. It will be interesting to see what it turns into in a few more days. Nice try though. Clementine, originally uploaded by Supriya O. No helicrysum in this cup of tea. I will need to find another use for this note, and I am sure I will. Helicrysum essential oil, by the way, is a completely different story: it’s like an eternal sun of honey. This time I kept the base rather light, staying cautious to not overpower the osmanthus. The top was lightened with Clementine CO2. The result is fruity and bright, but not very long lasting. Although the Clementine and citrus notes complement the osmanthus, the result is sunny. I wanted a dark osmantus. The base is yet to reveal how substantial it is. But I am not happy with the lasting power, not at this concentration, anyways. 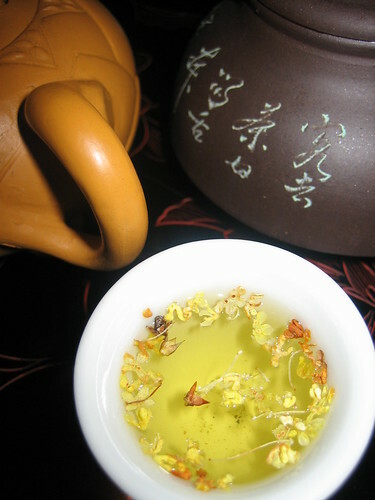 Green tea with Osmanthus, originally uploaded by tyneejash. More osmanthus absolute this time, to assert the osmanthisism of the composition. I decided to be a bit daring again, but this time go with a material I am more familiar with: tabac blond. It has an earthy, dry leaf quality that is not unlike tea. It creates an illusion of black tea. I also doubled up the other base notes (used in the previous versions) – ambrette, sandalwood, green tea. The heart remains basically the same, focusing on osmanthus, with a couple of supporting notes that share some similarities: a tad of lavender Seville absolute and linden blossom absolute. This time I used only the ethereal wild orange top note, and omitted the clementine. 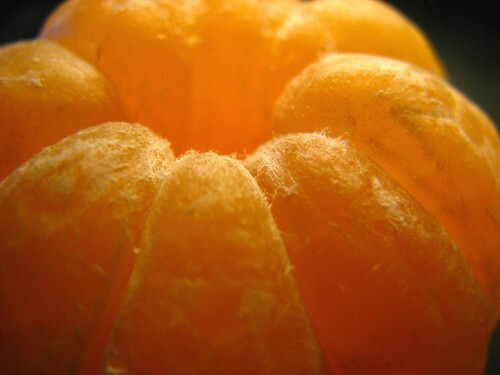 It is just fruity enough to help the osmanthus out, but not too sweet to distract from the darkness of the osmanthus. It really showcases the phases of osmanthus – from peach/apricot, to leather and finally to a smooth green tea. The only thing I am not happy with yet is the lasting power, and so I will increase the concentration and see how it improves the perfume. Cow Dung. Varanasi, originally uploaded by Claude Renault. My experimentations with patchouli continued. I decided that for now I was not happy with the rose and the patchouli. I separated the rose and mixed it with chocolate. Still not happy. The chocolate creates an amber-like effect. And though pleasant on its own, it’s not what I wanted. Not distinctive enough. Too similar to other perfumes I made already with amber and rose. I want to make something new. Third trial with this dark theme comes – and now it’s pathcouli and chocolate all by themselves. All the patchoulis you can think of, making for an in-depth patchouli study. But not a hippie one. I really loved this! But sometimes, the curiousity wins. And nasty things happen. One drop of dark, syrupy Vetiver from Indonesia did it. The earthy, dark chocolate turned at once into nothing but… a waft from distant cow-barn… Wait, it’s actually cattle dung! The same dung we used to fertilize our gardens and trees in my little agri-cultural (it was more culture than agri, and hence the separation). I would do my best to not get the dusty dung in my hair, and not to smell like it. But today, as I was wearing my mysterious concoction I was constantly drawn to smell my wrist, and it’s… cow dung again! Strange how out of context a scent may smell pleasing, thanks to its simple ability to bring back a memory so vividly. And we all know how memories feel and smell so much better from afar… I am positively certain that I prefer to mix patchouli, Vetiver and cocoa absolute rather than fertilize my garden with cow dung. Solitaire, originally uploaded by Michael J Metts. Now that I have sufficient quantities of a few more rare floral absolute – broom, cassie, linden blossom and osmanthus – I went straight away to work on my corresponding soliflores. Natural building blocks are extremely complex. One needs to remember that each and every single oil contains myriads of single chemical components, all interacting with each other in a magical way to create a “note”. Blend too many of those to create an all-natural perfume, and you are in danger of producing a cacophony of scents: a muddy, indecisive concoction that doesn’t know what she is thinking or saying. That is not something I would want to wear. So you can imagine how difficult it is to make a soliflore that will smell distinctively of a specific flower or plant. I love complex and evolving scents. With a passion. I dislike and stay away from linear scents that do not evolve and simply hammer the same note or accord over and over and over into my olfactory existence. To create a soliflore that smells distinctively of a certain flower or plant, I need to create an evolution that is consistently related to the specific note, in one hand; and does have an interesting life and a story to tell while on the skin. A perfumer that uses synthetics hase less technical limitations and is more often able to use the same note over and over in the different layers (i.e. : jasmine top note, jasmine heart note and jasmine base note). A natural perfumer is prone to have substantially more limitations here. Jasmine can be found only as a heart note. Therefore, there is no particularly jasminey note to keep the composition alive for long enough. To overcome this obstacle, I incorporate other notes, that are not the same, but are similar or close to the theme of the soliflore, in order to prolong the perfume’s life on the skin. For instance: in Yasmin, my jasmine perfume, I have included cassie in the base, a floral note from the family of mimosa, along with subtle, delicate amber and sandalwood, in order to extend the jasmine notes to the roots of the perfume. The result is perhaps a bit more complex than other jasmine soliflores I smelled before, but it is, nevertheless, a jasmine dominated perfume, made only of natural essences. The challenges are to do so without losing the “soliflore” on the way, without overloading the base with long lasting but muddying notes, without losing track of what we are here for – singing praise for a certain beautiful note that nature conceived and bringing it from the garden to our own skin-covered temple. This may seem marginal and unimportant. Naming a soliflore can be quite a challenge. Most frequently, soliflores bear the name of the flower or plant they mimic. If you want to be particularly imaginative, use a foreign language, such as French or Italian. I try to stay away from that, simply because it’s confusing: there are so many “Fleur d’Oranger” and “Osmanthus” now that one cannot distinguish a soliflore of one house from the other. I also prefer names that are more imaginative and alluring, perhaps a tad mysterious, and that have more meaning – beyond the simply name of the flower. My rose soliflore is called Rosebud (inspired by Citizen Kane) and is a symbol of purity through roses. My lavender soliflore pairs lavender with vanilla and orris to create a modern-day love potion, and is thus name Lovender. Viola, my violet soliflore, is also a woman’s name and a string instrument. The jasmine soliflore I created is called Yasmin, the Hebrew word for jasmine, and also the name of my best friend. My ornage blossom soliflore is named Zohar, also after my (other) best friend, and “Zohar Water” is the common name in the Middle East for orange flower water. My new version of my Linden Blossom soliflore is going to be called Tirzah, which is the name of the lindern tree in Hebrew, and also a beautiful women’s name. I am having a challenge naming the two other new upcoming soliflores I am working on at the moment: Osmanthus and Mimosa. I seem to have been running out of inspiration. Cute names on their own, but are they ever overly-used?! I am considering calling the mimosa perfume Acacia. That reminds me of desert. I kind of like that. But it’s not desert-y enough. And it’s not different enough either. Also, I already have plenty of perfumes that begin with “A”. But I digress. The bottom line is, as much as I love different permutations of the name of the plant – Mimosaique, Mimosa pour Moi, Acacioza, Farensiana… - The have already been used! Why can’t I come with something new?! So I will just concentrate on making these two soliflores last on the skin and be interesting and alluring for now, showcase the natural beauty of the flowers they are representing. I will worry about the names later. But if you have a good idea for a name, you are more than welcome to share it. If I pick the name you offered, I will give you a bottle of the soliflore you helped naming! 6-1-06 Crack, originally uploaded by Artbandito. A cloudy day today. A bit chilly. A reminder that summer will come to an end sooner than we would like to believe. I took the opportunity for working on some warmer perfumes today. Maybe a love-elixir for the winter. So today I started to work on a “red” potion, a warm and sensual blend of patchouli, cocoa and roses. This simple triad smells heavenly on its own, and there is no need to add much to it to make it stand out. These three speak for themselves. Out on a limb - Nature Will Overcome, originally uploaded by azredheadedbrat. I am wearing Sabotage today. It’s my newest creations for men, even though in fact it’s not all that new. I re-worked the formula of years ago, now using slightly different raw materials (the same plant essences, but from a different distillation). And I am very pleased with the result. The centre remains the same - Vetiver and tobacco. The first version was more grassy and citrusy, with plenty of Vetiver, tobacco, allspice, lemon verbena and lemon grass. It is far more refined now as the grassy notes are softer and more blended into each other. It is less earthy and grassy, and the Vetiver feels fresh and at the same time very smooth. I decided to use a Haitian Vetiver, which feels a tad citrusy and clean just as it is. To this I added orange blossom absolute and orange flower absolute to add a more sophisticated, citrusy heart, and it is now just the way I want it to be. To the Vetiver base I added tabac blond and vintage patchouli, as well as tonka beans to accentuate the tobacco note (tonka beans are used to flavour pipe tobacco and cigar leaves). 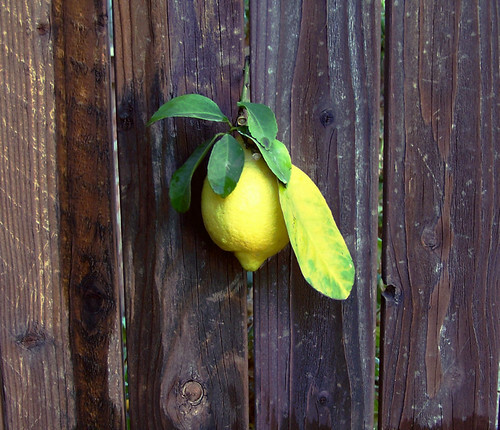 The leafy-lemony heart is lemon petitgrain (the leaves and twigs of lemon tree distilled into an essential oil). For the top I decided to use green peppercorns this time, instead of black peppercorns. The green ones are the fresh peppercorns, while the black ones are the ripe and dry ones. And the green pepper indeed smells fresh, in fact - almost citrusy. They are here complemented by lemond rind and bergamot. I chose the name Sabotage as a parody as well as an homage to classical men’s scents, with names such as Heritage, Équipage, etc. I decided to take the most refined, elegant masculine notes of tobacco, orange blossom and Vetiver - and turn them into something a bit humourous, easy and fun to wear. I really like this in the heat. Vetiver has a cooling effect. But the tobacco and tonka add warmth and interest and grow smoothly on my skin. Happy 4th of July to all of SmellyBlog readers in the US! To celebrate 4th of July, I decided to review a significantly gorgeous American perfume. It had to be a perfume that I haven’t reviewed on this blog yet. I already reviewed my favourites – Youth Dew, Private Collection and Obsession. If it wasn’t for the generosity of a fellow blogger, I wouldn’t have been able to write a review as a tribute to American perfumers today. Thank you, Victoria, for sending Anné Pliska along my way! She has been most welcome and I have been cuddling on my skin for 2 days in a row now! I can now understand your total infatuation with this perfume! Anné Pliska , made by South Californian independent perfumer by the same name, was launched in 1987 (two years after Obsession). Although it shares many similarities with Obsession, it is quite different and more sultry and complex. Think about the creamiest Shalimar vanilla, the amber of Tabu and Obsession, the orange-mandarin notes of Obsession, a tad of unique spiciness that is vaguely reminiscent of Joop! For Men - and an unusual, mysterious oomph of its own – and you get Anné Pliska. If you love these three bombshell orientals, you must try Anné Pliska. In fact, you must try Anné Pliska anyways because it is a special amber perfume, and an example for what a well-made American perfume is: boldly luxurious and sensual, yet sophisticated and elegant. P.s. Image is from Luscious Cargo, which carries all of the Anné Pliska line. For more information about where to get it visit the Anné Pliska Blog. Like other American luxury items of yesteryear (i.e. Estee Lauder's Youth Dew), it is also sweetly affordable. Don't you just love them parfum extraits under $100? Scents are very personal and need to be carefully selected. If you are shopping for fragrances in a department store or a perfume boutique, the environment may be overwhelmed by the many fragrances that reside under the same roof. You may get an olfactory fatigue quicker than you will in a more neutral environment such as your home. Most people buy their fragrances in the department store, drugstore or better yet – a specialty perfume boutique. If you are a fragrance connoisseur you also have the advantage of being able to buy online, as you are already familiar with many fragrances and already know your likes and dislikes. Fragrance shopping is fun – and also dangerous: you may end up smelling like something you hate! To avoid this from happening, you must be thoroughly prepared – mentally and physically. Either way – you still have goals, and you better make sure you achieve them before your nose gets too tired. One should master the art of not getting scent stripes shoved under your nose involuntarily or get sprayed pre-maturely with an un-godly scent. 1) Explore scents you never tried before. In fact, you may have decided to spend your whole day off doing so – it’s one of your favourite things in the world! 2) Check out specific scents (old or new) that you heard about and are very curious to sniff or try on. 3) Find a new scent for yourself. 4) Find a perfume gift for somebody. 5) Look at the beautiful perfume bottles. You may not even like perfumes, but collect flacons. 6) Buy a specific fragrance or fragrances that you have already decided on purchasing, as fast as possible before your parking meter runs out! You absolutely can’t bother smelling anything on the way! How willing are you to try new scents? How willing are you to get sprayed with an unknown scent, unsolicited? Knowing your boundaries will save you a lot of trouble, as you will be prepared and willing to defend them. There is no reason why a salesperson should spray your skin with perfume unless you ask for it. So make sure you communicate well what your intentions are. It has become a common practice among perfume salespeople to offer you a scent strip instead of readily spritzing your arm with perfumes they pick for you unsolicited. However, many salespeople still shove scent stripes under your nose (or close enough to overwhelm your olfactory pre-maturely) without your voluntary interest. It takes practice to learn how to recognize and predict those behaviours and be able to avoid smelling what you do not want to smell. On the physical level, if you know in advance that you are going for a snifforama – the most important thing is to come to the battlefield with as much unscented skin as possible. Leave home or work unscented if you can, it will help your olfactory be a lot more receptive, not to mention that you will be able to smell for yourself the evolution of the scent on your own skin. 2) A woolen scarf or a sweater (to refresh your olfactory bulb and avoid fatigue) or coffee beans (these are now requently offered on most perfume counters and less convenient to carry on your own – so they are only a second choice). Note: if you have none of those – you can use the less polite method: take good sniff of your armpits to neutralize your sense of smell and refresh your olfactory. 3) Lots of bare skin if you are planning to try many different scents. Wear T shirt or a tank top on hot summer days, or layer them with a jacket that you can take off once skin testing begins! Just like anything else in life, communication is the key. If you have a very specific goal when scent-shopping, communicate it with the sales person as soon as they approach you. In other words, be assertive! 1) Planned Snifforama: when the salesperson approaches you, explain right away that you are “looking around” and do not need help. If you are indeed spending the whole day there, don’t forget to go for lunch. It may even be a good idea to invite the salesperson to join you for lunch! Building a relationship with the salesperson will pay off – maybe next time when you visit to just sniff around you will be left alone; Your obvious eager passion about perfume may even pay off with generous samples; Or better yet – you may have just found a new friend to share your passion with – in the rare cases when the salesperson is a passionate perfumista themselves! What can be more fun than being able to discuss perfume with an intelligent and knowledgeable salesperson that can understand your fragrance whims, and wants to make you happy? 2) If you are here to check out specific fragrances, make it super clear with the salesperson. Ask them to help you find the scents. If they offer you to try a “new scent” that just came out which is not on your list, don’t be afraid to be firm and say you need to smell the others first. 3) Finding a new scent for yourself is the hardest task of all. Especially because in most cases, the salesperson does not have the adequate knowledge, training and sensitivity to be of real help. In most department stores, salespeople are pressured to promote new scents, and do not have a lot of knowledge of many of the classics or the older scents. There is also a tremendous gap in their knowledge and understanding of notes and fragrance families and fragrance categorization. Don’t be surprised to find out that you know more than the salesperson. If this is the case – you better get rid of them politely, by saying that you don’t need any help, thank you, you are just sniffing around; however, if they are indeed knowledgeable, their words will be worth their weight in gold! They will be able to introduce you to new scents that are terribly worthy of your attention, ones that are right up your alley – yet different, unusual and new to you. You better become friends with them or at least remember their name (and the names of the perfumes they offer you)! 1) Impulse buying: in my experience, impulse buying of scents usually leads to returns. Most people need some time to get to know a fragrance – either try it several times in different situations and moods, or get a sample so they can try it on their own time. It is very unusual to purchase a scent on an impulse and not feel regret afterwards. 2) More so – resist your impulse for buying a whole set of fragrance, shower gel, body lotion etc. of a scent you have never tried before. You need to try it first and absolutely love it to justify such an investment (we are talking both money and storage space here, two very valuable resources!). 3) I highly recommend not spraying yourself on the neck (or chest) with a new scent. If the scent does not work for you, it is harder to wash it out (unless you take a shower), and being exposed to it constantly (especially if it has a very strong silage) can be unexpectedly overwhelming and even cause headache and/or nausea. Whenever possible, get samples so that you can try the fragrances at home, whenever you feel like it! Ask the sales person if they have samples available, and if he/she offers the tester, tell him/her that you are already wearing another scent you were trying before (more than likely, this is also the truth – especially if your snifforama was a spontaneous one). Once you have overcome all the challenges of dealing with the salespeople, it’s time to talk about the real thing – sniffing and testing! 1) Sniff the scents from the bottle first. Although this is not the most accurate impression of the scent (the residues of the scent that was recently sprayed may be altered due to oxidation) it is a fast and easy way to shortlist which perfumes to try first. 2) If you like the scent, spritz some on scent stripe. Wait a few seconds so that the alcohol evaporates and doest not sting your nose and tire your olfactory bulb. 3) Take short sniffs rather than deeply inhale the scent. 4) Don’t forget to write the name of the scent on the scent stripe! 5) Keep in mind that the initial impression on the scent stripe is going to fade and change. 6) Don’t forget to refresh your olfactory after sniffing 3 or 5 fragrances, or whenever you feel that you can’t smell the scents and tell them apart anymore. This can be done simply by inhaling deeply for three times through a woolen scarf or coffee beans. 1) Skin does not smell or behave like paper, so once you have narrowed down your list of interests for the day, try the scent on your skin. 2) If you have planned your sniffing or perfume shopping trip, it is best that you don’t wear any scent so that you have enough skin available for testing. 3) I personally prefer and recommend using the wrist for scent testing. It is warmer than other areas of your body, and far enough from your nose so that you can decide when to sniff the new scent and evaluate it throughout its different evolutionary stages. 4) A second choice for testing scent is the bent of your elbow. It is also a warm area on your skin and easily sniffable. The other great advantage of wearing scents behind the elbow is that it will not be affected by the scents of your soap when you wash your hands. 5) I highly recommend trying on one scent at a time. It is easier to experience a scent on its own to truly understand how it affects you, including the mood it inspires in you. If you try two scents at once you may have more challenge determining which scent is responsible for the effect (positive or negative). 6) Testing more than one scent at a time: If you are an adept at testing scents and find it easy to concentrate on one scent or the other, you can use different areas of your skin for scent testing. Just try to remember (or jot down) the names of the fragrances and where you have applied them. Areas that are easy to distinguish from one another are the wrists (use a different scent for each) and underneath the elbows. Both areas are pulse points and are ideal for fragrance development on the skin. You can use other areas of your bare skin, but this may be very confusing as the scents will blend into each other in the air as you sniff them. The following tips will help you experience the scent to its fullest, and be able to decide which scent you like the most. Although these tips were written especially about Ayala Moriel’s samples, most of them apply to any samples you may have had the chance to procure on your fragrance expeditions. 2. Smell the perfumes from the vial first, to get your first impression. Keep in mind that the initial impression will fade quickly as the perfume interacts with your skin. Take short, quick sniffs rather than deeply inhale the scent. 3. Using scent stripes or cards: you can apply a drop of perfume on a scent stripe, and note the different dry out stages, and compare the different scents. However, this will not tell you how the perfume will smell on your skin, just how it smells on paper. 4. Apply a small amount of the desired perfume on the pulse points of your clean wrists (i.e. not previously scented). Let the scent develop on your skin for several hours. This way you will experience the dry out phase, and learn how the perfume interacts with your own personal body chemistry. 5. It is recommended that you wear only one perfume at a time on both wrists. This way you will experience the fragrance better. 6. Caution: Avoid contact with eyes. Keep out of the reach of children and pets. Wear on pulse points behind ears and on wrists, and avoid wearing on areas that are exposed to the sun. Keep samples away from heat and sunlight. If you develop any allergic reactions, stop using the product immediately. Just as personal as fragrance is, deciding when to wear what is an extremely personal thing. Don’t be surprised to discover that you like wearing some “winter” perfumes in the summer and “daytime” perfumes in the evening. I personally believe that you should wear whatever scent you want whenever you want. It is your own internal associations with a fragrance that will make it more suitable for this occasion or the other. Not what other people think is “correct” or appropriate. However, the traditional and widely accepted guidelines for matching scents to occasions, moods and seasons does make sense on many levels – psychological, physical and social. Oriental scents are best suited for evening and cooler seasons. Orientals are considered more seductive and sensual – therefore more appropriate for romantic occasions (such as going out in the evening). Also, because they are heavy, if worn in hot weather, they will become overwhelming. Heat releases scent and diffuses it better – so if you wear a very heavy scent in warm weather, it could be quite overwhelming. Also, heavier scents may have a narcotic or sedative effect on the mind, an effect that may be found counter-productive if you need to work hard and concentrate during the day. If you hold a full time position as a daydreamer this may not be relevant to you. Light florals and citrus scents are best suited for daytime and hot weather. This is because lighter scents are perceived as more “clean and polite” and therefore better for the work environment (or when you are more physically active – for most people this is during the day). The refreshing, energizing and rejuvenating qualities of many citrus scents make them ideal for hot weather, to balance the tendency to slow down and decrease blood pressure. Chypre scents, which combine fresh citrus top notes and a mossy, earthy base, are an interesting example for scents that are appropriate for all occasions. They are widely accepted in the professional world because they are classy and refined, and never quite overwhelming. On the other hand, they are sensual and can be enjoyed as pure seduction on more personal and romantic occasions. They are warm enough to be worn in the winter, but also refreshing for the summer. That being said, it is the personal associations and meanings that we relate to the scents that make them appropriate for certain occasion, season or mood. I first tried Samsara by Guerlain in the summer. A floriental composition made of plenty of sandalwood (over 30%) along with jasmine, ylang ylang, vanilla, amber, bergamot, peach and tonka bean – this is not quite what you would call a typical summer perfume. Yet, the sensuality of the jasmine and the sweetness of vanilla were balanced beautifully with the sandalwood base which is slightly dry – and created a lovely and refreshing summer perfume. Whenever I smell Samsara, I remember that summer. On the other hand, Creed’s Spring Flower – which is considered a harmless daytime fruity floral is a scent I worn mostly on special romantic dates. Although it is lovely as a daytime scent, whenever I smell it I remember those precious moments with my loved one, and its cheerful and crisp floral bouquet makes me feel happy in an instant. To sum things up, there is no right or wrong when picking a fragrance. It may take you time to get to know your preferences, and decide when is best to wear your favourite scents. It will take some time to build your own vocabulary and understand what the different scents mean for you. Trust your intuition and follow your emotions for a rich and fulfilling scentual life. P.s. At Ayala Moriel Parfums we also give Fragrance Consultations and Perfume Advice. Check out our new website, coming up late this summer, with our revolutionary, exclusive feature: FRAGRANCE CONSULTANT ON-LINE! Is there any reasonable explanation why so many independence days are when it's hot? Why not celebrate when it’s cold and boring outside? RED EVERLATING ( HELICHRYSUM SANGUINEUM ), originally uploaded by Viorica G.
Alas, I was so wrong. I should have known better, and take the Mediterranean book with me. But how could I have possibly know that I would ever need to use it, even if just for the sake of finding out which aromatic plants grew in my country, or just to remember a name of a flower for an obscure article I will have on something called “blog” 8 years from than? The answer is, I wouldn’t have possibly be able to know. And so, I am very thankful that at least I kept the book in the safe hands of people that would use it and would be able to answer my question when I am just about to publish a ground breaking article in my blog, about a tiny flower that looks like droplets of blood. Sometimes Google just don't cut it. At least not when it comes to matching the folklor names of certain Jewish flowers with their Latin names. So thanks to my mother and my grandmother (who shared between them the task of looking up the flower, and than emailing me the information), I now know that the little modest though strikingly beautiful flower, that is commonly known as “Dam Hamacabbim” (which literally means “Maccabees’ Blood”, allegedly grown out of the drops of blood that the Maccabees lost in their battles with the Helenist invaders sometime around 165 BC, rescued the temple and found the little can of oil, and to whom all Jews should be thankful if they like latkes and sufganiot/donuts). It is apparently a type of immortelle – from the same family of the immortelle we use in perfumery. 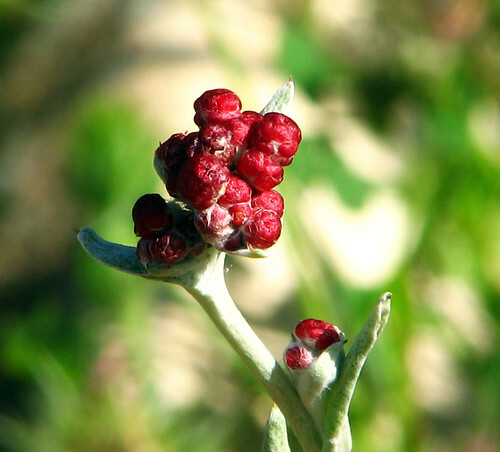 Only that this red everlasting flower has non scent that I can recall, and even if it had any, it would be impossible to obtain it from the very scarce plants that appropriately bloom every year around Chanukka. On another note, there is another type of everlasting flower in Israel, though I think it’s from a different family altogether – it’s purple, and looks like it’s made of paper, and grows on the beach. It is very often used in floral bouquets – everywhere in the world, I suspect – as it takes ages for the flowers to fade. They look dry even when they are fresh. If you know the name of this flower, let me know.